Bunting Bearings recently completed a large expansion to our Delta, OH, centrifugal casting plant. Centrifugal casting is one of our main specialties, and our customers value our ability to create high-value, cost-effective centrifugal castings that can be machined to a finished product. With this new expansion, we’re excited to further expand on our abilities to provide the highest quality casting services to our clients. We invested in an extension to our plant to bring new value to our customers. With our new plant, we can now produce longer and larger centrifugal castings with lead times of 2–4 weeks and expedited delivery times of 48–72 hours. We also dedicated new resources to our machine shop in Holland, OH. We installed five new live tooling machining centers as well as a vertical turret lathe to handle larger longer centrifugal castings. Perform QC testing at our in-house laboratory to ASTM B271– and ASTM B22. We at Bunting Bearings continuously seek new ways to best satisfy our customers’ needs. Investing more in our facilities and equipment is one such way for us to achieve this goal, and we’re pleased to expand our casting offerings to cover an even greater span of casting size requirements. Bunting Bearings is a leading manufacturer of high-performance, environmentally friendly bearings and cast materials. Our products include a wide variety of lead-free products made from top-quality polymers and bronze. To learn more about centrifugal castings or our other capabilities and services, contact us today. Bunting Bearings is the premiere name in the niche of environmentally-friendly bearing and cast bar solutions and supplies leading producers of sustainable energy, marine, medical and other commercial products with high quality bronze bushings and cast bars. Our eco-friendly alloy C87850 ECO Bronze is RoHS compliant and meets the lead-free safe drinking water act. The main difference between our ECO BRONZE and other lead-free alternatives is that ECO BRONZE is a great bearing material. Other materials compromise their bearing properties to become lead-free, but ECO BRONZE has proved to be as good as, and in some cases superior to, the leaded material it has replaced. ECO BRONZE is probably the most tested lead-free bronze material to-date; Bunting Bearings and Chase Brass had this material arduously tested by various independent laboratories in the USA, and all came to the same conclusion: “it’s tough,” “non-galling,” “does not get brittle at high temperatures,” “superior impact and compressive strength,” and “a great bearing material. Eco Bronze has gained acceptability in the potable water pump industry as it is S3874 & AB1953 compliant, it’s also gained acceptance in other industries such as construction equipment, Wind tower, food processing, medical devices and many others due to its great bearing properties. By incorporating ECO BRONZE into your manufacturing supply chain, your business can easily reach its sustainability goals. Being environmentally responsible is a goal that Bunting, Chase Brass and most of our customers share. By specifying a green product such as ECO BRONZE in lieu of a traditional leaded material you have taken a significant step forward. Furthermore, by leading your company with the procurement change your employees can take note and find additional ways for your business to decrease its environmental footprint. Selecting eco-friendly bronze products is just the start – how else does your facility plan to increase sustainability this year? With almost 80% of people in the US now shopping online, it’s no wonder that so many companies are investing in eCommerce strategies. Having a dynamic website is a non-negotiable in today’s economy. But it’s just one small piece of the puzzle for business owners who want to capitalize on digital traffic. Now that smartphones have become such an important part of daily living, companies have to incorporate that into their marketing plans. Even though fewer people complete mobile transactions on their phones, they are constantly doing research on products and pricing. For this reason, companies must meet their audiences where they are – on their phones. For this reason, we’ve launched the Bunting Bearings LLC app. The app is available for free on the App Store for iOS and for Android. Customers can view parts, read detailed product information, find local distributers, and more. The app has the full functionality of our website in an easy-to-use mobile format. While the industrial sector may not have the same buying trends as the retail sector, the ability to do research easily from anywhere is necessary in the digital age. By launching this app, we aim to make it easier for our customers to find what they need and learn more about each product, whether they’re ready to buy or not. By providing a positive user experience, we hope to make the buying cycle as easy as possible. To learn more about the app’s functionality or to download it for use, head over to the App Store. For more information about our products, service, or other news, feel free to contact us online. We look forward to hearing from you! Surveys from renowned sources like the Equipment Leasing & Finance Foundation show that a large percentage of executives believe the economy will improve over the next few months. And about 48.4% of respondents are looking forward to a tangible increase in profits in their respective niches. The North American market is responding to expectations for a more business-friendly climate. Coupled with a significant slowdown of some prominent Asian engines that have been monopolizing the global landscape and putting pressure on businesses in the United States, the “fair” economy is inching towards a “strong” rating. The President has budgeted $1 trillion for highways, waterways, airports, waterlines and bridges. He is also expected to allocate funds for affordable housing and construction of public health provision centers. In short, the infrastructure of the nation is set for positive growth thanks to a surge in planned infrastructure investment. According to the U.S Treasury department, infrastructure and public work projects valued at 330 billion dollars can provide up to a trillion in economic benefits. It goes without saying that the proposed trillion dollar plan should likewise provide a substantial return. What Happens When You Invest in Infrastructure? The construction and development projects can create more opportunities for STEM graduates and workers in heavy equipment. Companies that work with steel, cement production, and construction also stand to benefit from increased infrastructure investment. Bunting Bearings LLC is excited about the prospects 2017 holds. We have been supplying superior quality machined parts, bearings and metal structural products that assist the heavy equipment and construction sectors. If you are gearing up for a spate of new orders and are on the lookout for reliable vendors and distributors, you can connect with Bunting Bearings at 888.286.8464. Across all industries, there are seasons that are good for business, and others that tend to see a slump. For natural gas, pricing depends greatly on demand – and the demand varies depending on the weather. But unlike most industries that benefit from either warm or cold temperatures, natural gas actually benefits from both. As we look back on this past summer, it was pretty hot overall. Air conditioners have been running full-blast for the past three months, and in many households are still running even as we round the corner into fall. According to the U.S. Energy Information Administration, 33% of U.S. electricity was produced thanks to natural gas this year. And since this was such a hot season with heat waves around the nation, the strong demand for air conditioning was a boon for natural gas prices. Similarly, this coming winter will likely see the same strong demand, if not stronger in some locations. According to the Old Farmer’s Almanac’s winter predictions, the Northeastern U.S., Southern British Columbia, and Upper Midwest will be colder than normal with the potential for more snowfall than average. This means that people will likely be huddled up in their homes with the heat turned up. And if emergency situations require more supply than expected, the price of natural gas will climb higher as suppliers struggle to meet demand under harsh conditions. And in addition to regular seasonal price fluctuations, severe weather such as hurricanes and tropical storms can impact production, which in turn impacts prices. But weather patterns such as El Nino can have an even greater impact by altering the weather itself. During El Nino years, the U.S. can expect milder winters and summers, which means less demand for natural gas, and therefore lower prices. Obviously there are a number of factors that influence the prices of commodities, but with natural gas, the weather is indisputably a driving force. When thinking about life on a farm, many people might automatically think of a big red barn full of cows and horses. Today, however, the picture is quickly changing. The modern, successful farmer is highly-connected, utilizing the latest in crop, animal, and equipment management technology to create efficient, effective operations. So what are some of these new trends and technologies being used? Smartphones – Not just a way to make or take a phone call, they can help farmers keep track of their nutrients, manage tasks, and monitor equipment. Best of all, they allow the farmer to access these features from anywhere on their farm, or even out on the road. They are becoming as invaluable to agriculture as a shovel. Big Data – It’s a great catchphrase, but it is also very important to agriculture in that it can bring together data from around the world, or just on the local level, for analysis and action. This helps to eliminate trial and error, and provide better, more predictable results for operations of all sizes. Precision – From drones that can survey crops, to sensors, to robotics, precision agriculture is becoming more and more prevalent. Utilizing these tools to decide the application of inputs as well as the amount and location of inputs helps create sustainable, successful agriculture. Agriculture as Everyday Life – In what has been a surprising turn, agriculture has rebounded to become an increasing part of everyday life, and something that is at the forefront of the minds of the consumer. Consumers care about where and how their food is produced, desire local products, require transparency and information, and are aware of the need for environmental responsibility and conservation in agriculture. This trend towards the consumer caring more than before will continue to snowball. Agritourism – Not only do consumers care, they want to get involved. This means homestays at farms, bed and breakfasts, farm breweries, hands-on attractions, and so much more. It is a sector that continues to increase as time passes, and offers potential for increased revenues. Clearly, the agricultural sector is undergoing a major shift in perception and processes. As new technologies continue to be launched, it will be interesting to see how farmers will incorporate new emerging trends. Bunting Bearings has decided to update our online presence in an effort to make things easier for our valued customers and website visitors. The new website was designed to be responsive, so that no matter what type of device people are using, they’ll be able to browse and maintain full functionality. Since many industrial buyers are now using mobile devices such as tablets and smartphones to view products and conduct research, it was important for us to create a website that works well no matter which device is being used. 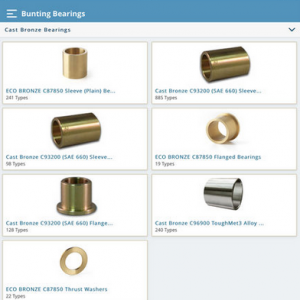 In addition to being responsive, the new Bunting Bearings website makes it easy to search for products by making our online catalog front and center, and incorporating a PDF version of our catalog. We’ve also made it simple to find relevant SDS sheets as well as our ISO certificate to assure the quality of our products. A PV Data Chart further helps prospective customers learn what types of materials and products will work best for their applications depending on their necessary requirements. For customers that are looking for local bearing suppliers, we’ve also listed our preferred distributors on the website. We understand that our customers are located throughout the country and the world, so having a bearing distributor close by can be reassuring, especially in an emergency. Furthermore, our website now features an Interchange Search. For customers who already know the part number they’re looking for, they can enter it into the search bar in the upper right corner of the webpage to quickly find what they need. The tool is especially useful for repeat customers. We’re pleased with our new web presence, and encourage users to visit the site and let us know what you think. We look forward to hearing from our fans and followers on Twitter. Though Earth Day is now over, many companies are still tasked with the job of finding more environmentally friendly materials and processes. It’s a difficult and time consuming objective, but one that is well worth the effort. One way to lessen your environmental footprint is by choosing “green” products to incorporate into the supply chain. Our eco-friendly alloy C87850 ECO Bronze is RoHS compliant and meets the lead-free safe drinking water act. The main difference between our ECO BRONZE and other lead-free alternatives is that ECO BRONZE is a great bearing material. Other options often compromise their bearing properties in an effort to become lead-free, but ECO BRONZE has proven to be equal, and in some cases superior to, the leaded bearing materials it has replaced. In addition to environmental concerns, the safety of products coming into contact with drinking water is of great importance. Given the recent epidemic of lead contamination in drinking water throughout the United States, it’s important to find alternative lead-free materials for use in these types of applications. By incorporating ECO BRONZE into your manufacturing supply chain, your business can more easily reach sustainability goals. Being environmentally responsible is a goal that Bunting Bearomgs, Chase Brass and most of our customers share. By specifying a green product such as ECO BRONZE in lieu of a traditional leaded material you have taken a significant step forward. Furthermore, by leading your company with the procurement change your employees can take note and find additional ways for your business to decrease its environmental footprint. Selecting eco-friendly bronze products is just the start – how else does your facility plan to increase sustainability this year? 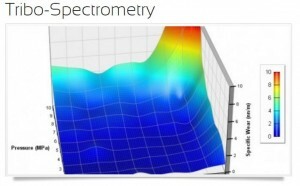 Tribology is the study of friction and wear on surfaces and materials that are in motion. Bearings are the perfect example of products that would require some background in tribology, since they are constantly rubbing against other items in their everyday function. Bunting Bearings has always been at the forefront of bearing calculations including PV wear and friction data, and when we required independent verification on how effective a bearing material our new lead free ECO Bronze material was, we turned to the leading US tribology expert, Dr. Robert Adams. Dr. Adams’ doctoral research was focused on characterizing plane bearing materials’ PV friction and wear performance profiles. Dr. Adams applied his knowledge to develop a tribometer that reduced the time needed to obtain reliable PV wear and friction test results. Dr. Adams’s company, Tribis Engineering Inc., is now finalizing all the PV data that will show that ECO Bronze is the first real cost competitive material to current leaded and lead free bronze bearing materials. Bunting will be releasing tribological data on many of our bronze compounds in the near future. There is not a single “best” bearing material and surface combination. Understanding how the various materials compare under these changing conditions makes it possible to select the “best” bearing material and surface combination for a particular application. Tribo-spectrometry helps us to understand the particular friction and wear behavior of differing materials, and make the right choices for current needs. Smooth Filling of Molds – To reduce risks of defects caused by inclusions and turbulence, which would compromise the product you receive, we use a grating design for reliably smooth mold fillings. Superior Physical Attributes – Exceptional mechanical properties. Dominant casting strength is achieved by using the permanent mold casting process rather than the sand casting process. Excellent Surface Finishes – As-cast products have top-quality finishes and dense surface structure, which makes them easier to polish. Closer Net Shaped Profiles – Intricate shapes and designs can be cast by our expert team, as per your specifications, using the permanent mold process. Precise, Consistent Control – Our electric melting furnaces produce consistent metal heats while our permanent mold dies have precise dimension control, and our CNC machines work with unmatched precision. Weight Reduction – As compared to the sand castings, the permanent mold castings are more lightweight due to both the materials used and the slimmer sections (as thin as 0.09”) held within them. Tight Pressure – Get superior pressure tightness and soundness by using our high-quality permanent mold casting process for your order. Few Defects or Part Variation – It is crucial that you get uniform parts for your projects, so we use metal dies that minimize part variation to as little at only +/-0.002”. 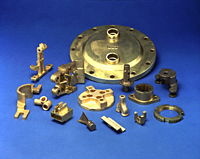 Metal dies vary significantly less than sand-casting, which lowers part-to-part variability significantly. Tiny Cast Holes – Small holes (as tiny as 0.187”) can be cast into parts, with very close tolerances. This ability often eliminates the need for any secondary drilling and gets your finished part completed quickly. Eco-friendly – Bunting recycles grates and scrap through our furnaces to reduce our company’s carbon footprint. We believe in taking responsibility to minimize our impact on the environment and therefore support green practices. There is a range of benefits when ordering permanent mold castings and products from Bunting Bearings. Our team of certified professionals look forward to producing high-quality, intricate castings and products to meet your needs and wants. Contact us to request a quote today.